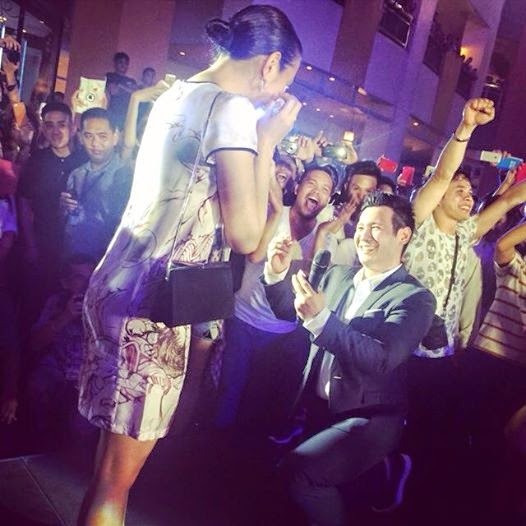 MANILA, Philippines - Celebrity couple John Prats and Isabel Oli are now engaged. The 30-year-old ABS-CBN actor proposed to his long-time girlfriend in a flash mob on Wednesday, September 24 at the Eastwood Mall plaza in Quezon City. The proposal was confirmed in various social media posts of celebrities and netizens present at the surprise event. John Prats ended the whole grand gesture with a dance, a ring, and the question, "Pwede ka bang maging Mrs. Prats ng buhay ko?" Isabel immediately said yes! Part of the surprise is his message through a video presentation and a fireworks display. Celebrity friends immediately took to social networking sites to congratulate the new couple. John's sister Camille posted some videos on her Instagram account captioned: “Congratulations my soon to be sister in law!!! so happy to officially welcome you in the family." Aside from Camille, present during the proposal were their friends Chynna Ortaleza, Sam Milby and Angelica Panganiban. In January this year, John has denied he already proposed to Isabel but he has admitted in press interviews that he's ready to settle down with her. John and Isabel join several celebrities who got engaged this year which includes Heart Evangelista and Senator Francis Escudero and Marian Rivera and Dingdong Dantes.